From the tropical rainforests to the magnificent white sand beaches, Puerto Rico will enhance your senses with its stunning beauty. Puerto Rico has a deep heritage and it displays this with pride at its numerous historical sites throughout the main Island. Located in the North Eastern Caribbean, Puerto Rico is currently a protected territory of the United States and is closely associated politically and economically with the United States. Tourism is a major industry in Puerto Rico as they host millions of visitors each year; many of these tourists are from the United States where they share the same currency with Puerto Rico. The natural beauty of Puerto Rico, from its rolling mountains, turquoise water, and amazing beaches will inspire everyone who experiences it. Boasting one of the strongest economies in the Caribbean, Puerto Rico has enticed many major American corporations to invest. Industries such as pharmaceuticals, textile manufacturing, petrochemicals and electronics are thriving and livestock and dairy production dominate agricultural pursuits – once the primary industry –. 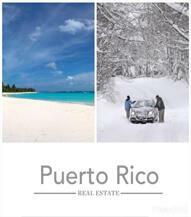 Puerto Rico remains a stable real estate environment with numerous investment opportunities available. Because of its close connection with the United States, real estate transactions are similar to the U.S. as are property rights so investments are safeguarded. Puerto Rico is densely populated, which means land is scarce and values appreciate accordingly. Puerto Rico is a unique blend of tradition and culture; a melting pot of ethnicity the essential element of its society. Native Taino, Spanish, African and American influences all play a role in the Puerto Rican lifestyle. With a population of nearly four million people, Puerto Rico is a bustling island of proud citizens who identify with America but fiercely embrace their own heritage. Contemporary meets traditional where architecture is concerned. Historic buildings stand elegantly in the shadows of high-rise beachfront condominiums, resort hotels, and casinos. Restaurants abound with cultural delights from local soups and desserts to seafood! The people of Puerto Rico are warm, friendly and hospitable. They go out of their way to make everyone feel welcome. There is something fun for everyone in Puerto Rico. You can visit the rainforest and enjoy the tropical flora and fauna. Take in the stunning beauty of the various natural waterfalls that dot the island. Puerto Rico is also memorable to many because of its exquisite coffee grown in the mountains. Obviously swimming is popular and there are miles of public beaches available with changing and shower facilities, concession stands, and vendors offering water craft rentals, scuba diving and snorkeling tours. Try horseback riding on the beach or hiking the forest reserves trails. Anglers will be awestruck by the blue marlin and other big game fishing available or wetting their lines in one of the inland lakes. Puerto Rico recreational activities are highlights on anyones to-do list in this enchanting Caribbean paradise. We would be happy to discuss your Puerto Rico Real Estate options. Call Us Today!